Geared toward general and work needs, Checklist Wrangler allows you to easily manage templates and auto create checklists weekly, monthly, or yearly. It will show what objects you must collect or actions you need to take. A great way to remember the essential checks for daily routines. Frequent or once in a lifetime checklists are easily handled. Whether assembling the items in your pocket, household chores, the contents of your picnic basket, or checking the condition of important equipment, Checklist Wrangler is equally valuable. 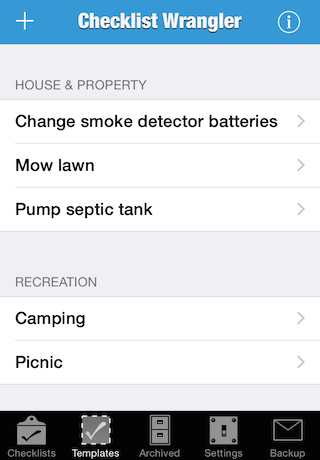 Everyday or specialized, Checklist Wrangler helps you remember the details. - iCloud Sync - Checklists and templates can be synced between all devices that share the same iCloud account. 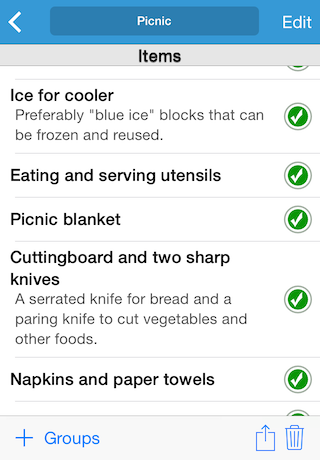 - Multiple checklists allow you to keep track of more than one list at a time. - Templates for tasks you need to do more than once. - Checklist auto-creation for everyday lists or just on certain weekdays. - Quick Editing - Rearrange list items by just tapping and holding on them. Double tap an item to edit it. 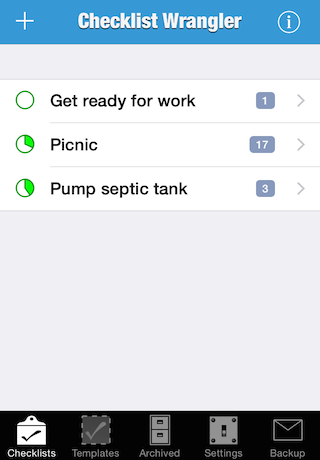 - Quickly create checklists from text copied from any app (i.e. lists from e-mail, webpages, etc.). - Organize related templates into groups for easy access. - E-mail checklist to friends, family, and coworkers. - Print checklists when you need a hard copy. - Fixed bug where only the top left part of the display would be visible on iOS 8. - Now supports multitasking in iOS 9 on on the iPad. - Added support for iPad Pro screen resolution. - In the new checklist item screen, you can now import existing items from a template. - Fixed a bug that could prevent the Uncompleted Badge settings from working. - Fixed a bug that could cause a crash when syncing via iCloud. - Fixed a bug that could cause a crash when creating a new empty checklist or template. - Fixed a bug that could cause the app to crash when creating a new checklist from a template. 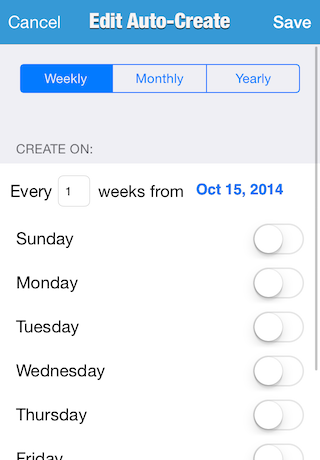 - Fixed a bug that could cause reordering list items to fail on iOS 7. - Fixed a bug that caused a crash when importing old format backup files. - Fixed a bug that caused checklists created from emailed links and the clipboard to be empty. - Fixed a bug that caused the printing to not work on an iPad running iOS 8 and newer. - iCloud Sync - Checklists and templates can now be synced between all devices that share the same iCloud account. - Background updating - There are no more reminders for auto created checklists, they will be created automatically even when you don't launch the app. - iOS 7 native - The app icon and user interface have been updated to support the new flat iOS 7 design. 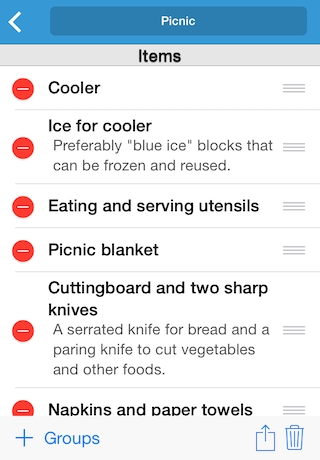 - Edit mode optional - Rearrange list items by just tapping and holding on them. Double tap an item to edit it. - Added support for iPhone 6 and iPhone 6 Plus screen resolutions. - Miscellaneous changes and bug fixes. - Checklist Wrangler now requires iOS 5.0. - Fixed a bug that could cause a crash when creating a checklist from text on the clipboard. - The "Cancel" button in the new items screen is now changed to "Done" after an item has been added. - Modified the return key behavior on the new items screen. If the name field is active, the note field will be made active. If the note field is active, the return will be equivalent to tapping the add item button. - The first letter of the name and note fields on the new items screen are now capitalized by default. - Fixed the ordering of templates in the "Checklist From Template" screen to match the ordering of templates in the rest of the app. - When multiple checklists are created from templates and manual sorting is enabled, the new checklists now display in the same order as the templatesÊthey were created from. - Templates can now be ordered manually or alphabetically. - When editing the grouping for a checklist or template, the groups can now be reordered. - The new items screen has been modified to avoid confusion when trying to add a single item. - Fixed a bug where swiping to delete an archived checklist could crash. - Fixed a bug that could cause the new items screen to fail to display properly on iOS 3.1.3. - Checklists can now be created from any text on the clipboard (i.e. lists copied from an e-mail, webpage, etc.). - The new item screen has been redesigned to allow for quickly adding multiple items to a checklist or template. - Instead of a new item always being added as the last item in a group, it can now be added as the first. - Added a setting to allow for three sizes (large, medium, and small) when printing a checklist. - Redesigned the archived checklists navigation. They are now grouped by year, month, and day. - Fixed a bug where re-creating an e-mailed checklist could result in two copies of the checklist. - Fixed a bug that could cause a crash if you tried to move an item from one group to the bottom of another group in a checklist or template. - Updated app icon for retina display on the new iPad. - On the iPad, checklist/template titles no longer scroll with the list of items, and are now always visible. - Fixed bug that could cause changes to a checklist title to not be saved. - Fixed a bug that could cause a crash when the device sleeps. - Fixed bug that could prevent checklists from being auto-created from a template. - Fixed a bug that could cause templates to to not appear when the "+" button on main screen is tapped and "Checklist from Template" is selected. - When editing a list item, the save button will now update after text is entered via diction on the iPhone 4S. - Fixed a crash when deleting templates. - Checklists can now be arranged in groups. - Uncompleted checklists can be automatically archived after a specified number of days. - Print checklists and templates to any AirPrint compatible printer.